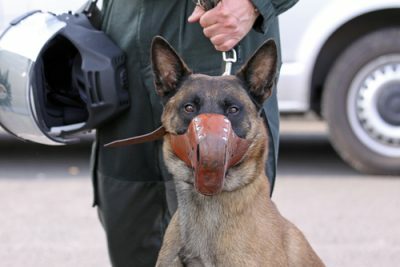 The fourth amendment protects people against the use of excessive force by police K-9s trained in the bite and hold technique. Specifically, Title 42 of the United States Code, Section 1983 makes it unlawful for the police to use unreasonable or excessive force in the apprehension and arrest of a suspect. Lawsuits are brought under the federal Civil Rights Act of 1964 (42 U.S.C §1983). The landmark ruling which addresses the use of force is Graham v. Connor . The ruling states that the degree of force used must be based on a standard of “objectionable reasonableness.” Graham specified four principal factors in determining whether a particular kind of force was justified: the threat the suspect posed to the officer, the nature of the crime, whether the suspect was resisting arrest, and whether the officer could have used a lesser force to make the arrest given the totality of circumstances present at the time of the apprehension. Municipalities become defendants in lawsuits for fourth amendment violations due to excessive canine force because (a) their policies and procedures; (b) unreasonable conduct by not removing a dog from service when appropriate; (c) inadequate training or supervision of the handler or the dog; (d) indifference to previous conduct of a K-9 and failing to document or conceal such conduct; (e) failing to employ training techniques that would reduce the risk of harm caused by their K-9s, or (f) indifference to the dangers of the bite and hold technique. There are many appellate rulings on the issue of excessive force by police K-9s under the Graham standard. Decisions are affirmed or reversed based on the fact pattern of each case. Common themes in many cases deal with the duration of the apprehension by the K-9, the severity of injury sustained by the plaintiff and the policies and procedures of the police department for use of K-9s for suspect apprehension. Depending on the plaintiff’s allegations, individual police officers are sued, the municipality is sued, or both are named as defendants in the same lawsuit. It is outside the scope of this article to make a legal analysis of appellate rulings on excessive force claims involving canines against municipalities. I refer the reader to Weintraub for an overview of municipal liability and the immunities they have against excessive canine force claims (Weintraub, A Pack of Wild Dogs: Chew v. Gates and Police Canine Excessive Force (2001) 34 Loy. L.A. L. Rev. 937). Examples of some rulings can be found in Smith v. City of Hemet, 394 F.3d 689, 707 (9th Cir. 2005), Miller v. Clark County, 340 F.3d 959, 968 (9th Cir. 2003), Chew v. Gates, 27 F.3d 1432, 1462 (9th Cir. 1994), and Hooper v. County of San Diego (629 F.3rd 1127 (9th Cir. 2011). In Smith v. City of Hemet and in Chew v. Gates the Ninth Circuit reversed the District Court’s summary judgment on the basis that genuine issues of material fact raised triable issues for a jury to decide whether excessive force was delivered by the K-9. In Miller v. Clark County the Ninth Circuit affirmed summary judgment in favor of the defendant. In Hooper v. County of San Diego the appellant was arrested for resisting arrest after the police discovered that she was in possession of methamphetamine. A police K-9 was called to assist and the dog tore off large portions of her scalp. The court ruled that resisting arrest did not bar the appellant’s claim of excessive force against the County. In Lowry vs. the City of San Diego, the plaintiff challenged the constitutionality of the bite and hold technique (Lowry v. City of San Diego, 818 F.3d 840, 856 (9th Cir. 2016). The plaintiff sued the city on the bases that the police department’s policy of utilizing dogs trained in the bite and hold technique was unreasonable and excessive and the cause of her injury. Hence, use of these dog violated her fourth amendment rights. In this incident, the plaintiff was bitten in her face by an off-lease police K-9, named Bak, deployed to search an office building at night because of a suspected burglary. The dog found the plaintiff sleeping on a couch, but she was not the suspect. The plaintiff had accidentally set off an alarm and shortly after that fell asleep in the suite in which she worked. Initially, the District Court granted summary judgment for the defense, but the Ninth Circuit reversed this decision. Subsequently, in June 2017, the Ninth Circuit sitting en banc reaffirm the District Court’s summary judgment ruling. No test was made of the constitutionality of the bite and hold technique, however. For a detailed legal analysis of this case see Dobrott (Dobrott, Excessive Force, Police Dogs, and the Fourth Amendment in the Ninth Circuit: The Use of Summary Judgement in Lowry v. City of San Diego (2018) 59 B.C.L. Rev.E. Supp. 1). Nonetheless, there were sufficient bases to support the plaintiff’s argument that utilization by the municipality of dogs trained in the bite and hold technique was excessive and unreasonable. Namely, as discussed earlier, because of their inherently dangerous nature, these dogs are difficult to control and likely to bite any person they encounter. Hence, it was foreseeable that Bak would bite and injure the plaintiff, a non-suspect. In fact, the police officer testified that Bak could attack someone other than the suspect because dogs “are just animals.” Unfortunately, the court did not consider the inherently dangerous nature of attack-trained police canines in making their decision. Attack-trained police canines are inherently dangerous animals. Their behavioral nature and how they are trained and used makes it likely that a person’s fourth amendment rights will be violated. Bite and hold trained police canines are difficult to control. They often make behavioral errors such as biting the suspect for excessively long durations or not releasing the suspect when commanded to do so by the handler. As such, even in the hands of the most experienced handler, there is the high probability that canine force will be delivered in a manner that violates the standards outlined in Graham. Every deployment of a bite and hold trained K-9 carries the foreseeable risk that a person, suspect or non-suspect, will be severely and permanently injured. The technique is cruel and inhumane because its application can cause lifelong pain-and-suffering and profound psychological damage. There has been a debate about the use of a supposedly less violent technique. Namely, that of find and bark (also referred to as circle and bark). This technique teaches the dog to alert by barking after finding a suspect. Proponents of this technique argue that its use will reduce bite frequencies. However, contrary to what one might expect, find and bark trained dogs have higher bite ratios (that is, they were more likely to bite suspects during apprehensions) when compared with bite and hold trained dogs (Mesloh, Barks or bites? The Impact of training on police canine force outcomes. Police Practice and Research, 2006, 7, 323-335). Hence, find and bark trained dogs appear to be just as dangerous, if not more so, then the find and bite trained dogs. Both training techniques instill in the dog a high degree of aggressive arousal and the strong desire to find a person to bite. Winning a lawsuit against a municipality for excessive force by a police K-9 depends in part on proving that the policies and procedures of the police were the cause of the plaintiff’s injuries. Detailed information about the individual dog involved in the event and what the municipality knew about the dog is needed. Discovery should focus on collecting all training and deployment records about the dog and the policies municipalities have about the use of these dogs. The handler of the dog needs to be questioned about (a) the methods used to train the dog; (b) past bite instances; (c) any difficulties with the dog; (d) the protocol followed when the incident happened, and (e) the supervision received from the supervisor of the canine unit. It is incumbent upon municipalities to find ways to mitigate the severe danger attack-trained police canines present to the public and to the suspects these dogs apprehend. Police departments are reluctant to change policy about when these dogs are used or how they are trained, however. This resistance remains in part because current case law favors the police in that it does not regard police dogs as a deadly force. Hence, police know that these dogs can be deployed without being unduly concerned about a person’s fourth amendment rights. In general, the police are defensive about their dogs and handlers cover-up for the behavioral errors their dogs make. Significant changes in the law regarding excessive force caused by attack-trained police K-9s will likely come about only when courts begin to recognize the inherently dangerous nature of these animals. Part I of this series explains why attack trained police canines are inherently dangerous animals. Visit Wikipedia for background information on the history of police canines.